My #FF this week was a lucky find in the cheap aisle at Michael’s. 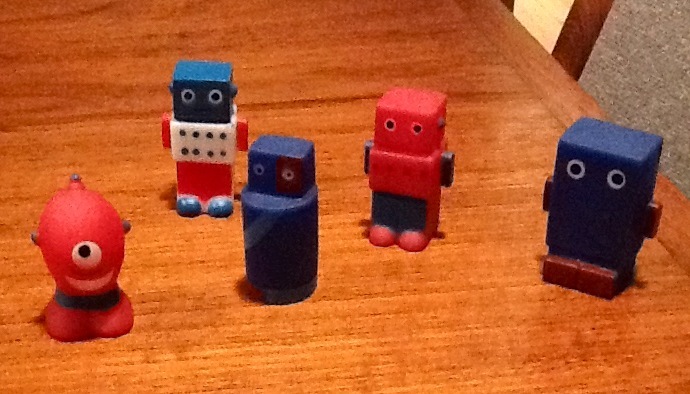 This set of 5 rubber robot finger puppets is perfect for a 5 little robots rhyme. Anyway, it can use a little work, but it could work. Anyway, Angela is doing the round up this week, so check out her blog for the flannel fandango. Oh, and I believe I am hosting next week (that’s March 23rd, right?) YES! I am hosting next week, see you then! I love when the Flannel Friday-ers write their own stuff. And it’s hard to find good stuff for preschoolers about robots. Well done. Thanks! Yeah, for a bit i’d find something, but I gave up. In he end it was easier to DIY it.